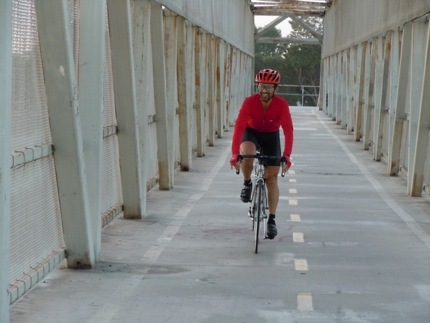 Bernie Hernandez cycles to and from work every day for a total of 46 miles. He wants everyone to catch cycling fever. There was one particularly rainy day in March this year that Bernie Hernandez did not ride his bicycle to work. With that day as the exception, every morning of 2011 he has made the 23-mile trek each way from his home in Huntington Beach to the Boeing facilities at the Long Beach Airport. Riding on PCH, the San Gabriel River bike path and local streets, it takes the 50-year-old a little over an hour each way. Driving takes 45 minutes in light traffic. Even though riding takes a longer, Bernie has little need to go to the gym for exercise. In fact, Bernie is probably in better shape than the vast majority of people half his age. Bernie has biked to work since 1990. It was when he moved to an office closer to his house that riding to work every day became a more realistic possibility. Each morning, he rolls up his work clothes in a modified drawstring bag, rides to Boeing’s gym where he showers and changes and parks his bike at a rack before beginning work. Bernie is just one of a number of nominees for Metro’s Human Powered Commuting Awards. Winners will be announced before Bike Week LA, which is being held May 16 to 20. For a rundown of all of the events taking place during Bike Week, check out metro.net/bikeweek. Way to go Bernie! Very inspiring! Very inspiring story! As funny as it may sound, it is probably safer to bike along the bike paths in Huntington beach than to drive there with the highest DUI rate in California. Great profiles. Keep it up.